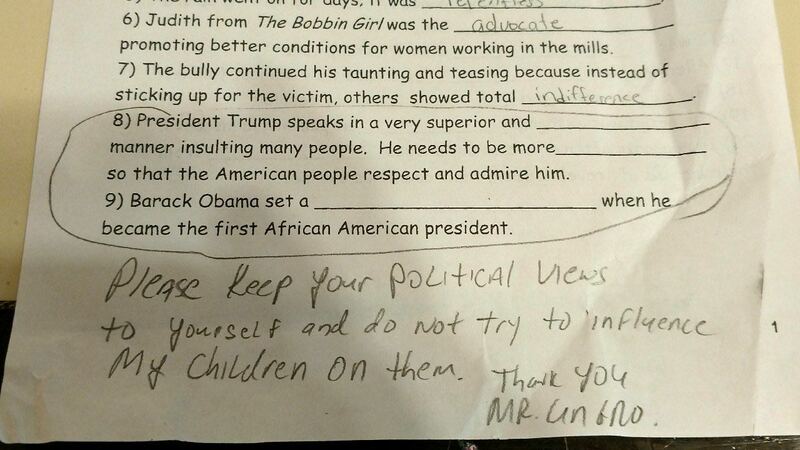 The parent of a sixth grade student sent a note to his child’s teacher after he found the teacher spewing anti-Trump indoctrination in his daughter’s classroom. The teacher was telling his captive audience President Trump was insulting while praising Barack Obama. Did a Staten Island teacher cross the line by inserting sentences on President Donald Trump in a vocabulary sheet she assigned as homework? At least one parent of a student in her class seems to think so. Vincent Ungro, an Annadale father and unabashed Trump supporter, said he was angered when his 11-year-old daughter, a sixth-grader at Paulo Intermediate School (I.S. 75), came home with a vocabulary assignment containing sentences he believes were disparaging to the president and inappropriate for the classroom. The vocabulary sheet, drawn up by English teacher Adria Zawatsky, gave students sentences and had them fill in the blanks, choosing from a list of words that would complete the sentence and make sense.